I have some answers, but not all. But what I do know right now is that our season is a total washout. After using what many say is the best radiologist on the east coast to ultrasound Jack’s pastern, my vet called me with the opinion. The main abnormality that could be found had to do with the collateral ligament near the coffin joint. It appears that the inside of that ligament is enlarged, but unfortunately because of its location (partially in the foot) it is a difficult place to ultrasound. 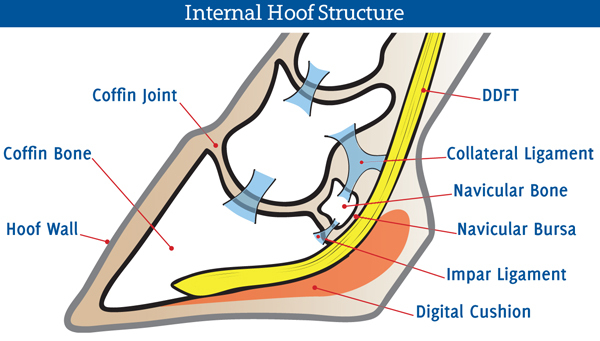 So, our next step is to go to Tryon Equine Hospital, which is the closest facility to have a standing equine MRI. The MRI will give us so much more information around what is going on in Jack’s left fore, and allow us to come up with a more specific rehab plan based on the images. Some of you may recall that Tryon is where Foster had his surgery, and I admit there is a strong sense of deja vu that I hope is mere coincidence for Jack. For now, I’ve been told to expect 10-12 months of rehabbing Jack but with the expectation to return to his job as an eventer and sporthorse. Our MRI is July 2nd and 3rd (for follow-up images) and I will certainly keep everyone in the loop as we go on this unexpected journey. Stay tuned. Dang, this is exactly the same injury as the horse I rehabbed. Fingers crossed that it’s just a strain and nothing major! I would love to hear more about your experience with this! How long was your rehab? Did the horse return to full work thereafter? So… mine had a small tear, if I’m remembering right. He had a few months of stall rest but was, um… not a good candidate for that, so ended up turned out for a year instead. I got him at the tail end of that and spent about 4 months working him back up to a normal work schedule. I was very careful about the rehab, starting on excellent footing and only straight lines, then eventually adding circles, varying the footing, etc. I kept him on a 4-week shoeing cycle. He did eventually return to showing, and I showed him through the 1.05m (jumping 1.10m at home), and then he re-injured his foot about a year later running around like an idiot in his paddock. These days he’s serviceably sound but obviously at higher risk of re-injury due to his history, so he’s mostly retired. Honestly, that horse was kind of pre-disposed to that due to his conformation. I know other people that have rehabbed the same injury and the horse has returned to a lengthy career afterwards. I think the most important part is the recovery and especially the rehab. Slow is fast with soft tissue. I’m so disappointed for you! I’m glad there’s a chance he’ll be able to come back and do his job fully again. Fingers crossed for best case scenario! Ugh, so sorry to hear this. Hoping that you get good information from the MRI and a solid plan for rehab. I am sure you have a ton of offers, however anytime that you would like (need) some saddle time please let me know. My two are always up for an adventure! Ugh, I’m so sorry to hear this. Fingers and toes crossed for good news next week! I’m so sorry to hear that things are a little more complicated 😦 Sending you all the best while you continue hunting answers! Nooooo!!!!!! Bad Jack!!!!! If you need a place to stay let me know!!! We won’t be there but the door is always open for friends!!! What a bummer to hear this news. Hopefully it ends up being something that is quick to heal and has no lasting impacts. Sending lots of love to you and Jack! So frustrating! Just when you were hitting your groove! Keeping my fingers crossed that you get the “best of bad news” on this. If not, I have heard of various horses with similar injuries that went back to their jobs with proper rehab and conditioning.